Apologies for the sudden and prolonged silence! I published my last post last Friday and then was planning to post this immediately afterwards, but my laptop decided to take a flaky, which was followed shortly after by me taking a flaky, chucking the laptop at P and flouncing off in a huff! If you are interested on why the lengthy silence, I then spent the rest of the night packing for... the weekend when P, Small Boy and I took a trip to Kendal to visit one of my best friends and his family... followed by Small Boy and P driving home and me catching a train on Monday to Leeds for a course that I attended with work, until yesterday, before getting home at 10.30 last night! I did have my work laptop with me, but it doesn't have the appropriate shaped hole to take our memory card. The work trip also explains the sudden apparent love for selfies in this (next?) week's roundup which I hope to publish tomorrow... but then I have a friend coming to visit this weekend, so that actually may not happen now til Monday... God, I so need a quiet week! Happy with outfit: 3/5 Despite the fact I love this blouse, I felt a bit bleh today. The blouse kept riding up to create a "shelf" above my bust: not the most flattering look. This hasn't happened before, so I can only presume the cardigan was to blame. The outfit looks a bit wintery TBH, but the weather today was awful - it absolutely chucked it down all day. That most likely didn't help my mood. Happy with outfit? 4/5 This is another blouse that doesn't do well under a cardigan. You can see here it looks quite rumpled and the collar is crumpled. I really love this blouse, but feel it needs constant adjusting when wearing it. New jeans, bought yesterday from Gap, which means I can now refashion my old ones, which have gone through at the knee, into a skirt. Hurrah! Very tired in this photo, and my eyes were really dry from wearing my lenses, which is why I look a bit druggy! And I've just realised I've worn 3 Colette patterns in a row! Happy with outfit: 5/5. This skirt is already proving so versatile. I love it, although it does seem to be difficult to photograph! Happy with outfit? 5/5 I love this dress and am glad it's summer so I can wear it again. The belt however only lasted til lunchtime, as it's like a corset, it's so tight and it gave me a stomachache! And, yes, my legs really are that pale! Happy with outfit: 4/5 I am still not sure this blouse is that flattering, due to the excess fabric at the front. It also crushes like mad. But it got a lot of love on Flickr last week, which is making me think more positively about it. And when I told my team today at work that I'd made it, they seemed impressed (although totally nonplussed when I tried to explain a bias binding maker to them. Isn't it funny how non-sewers don't even consider how their necklines are finished?). After 2 days of sun, my car thermometer told me this morning that it was 6°C. That's a Scottish spring/summer for you, folks! Happy with outfit? 5/5 I needed to be quite smart for a visit to a supplier in Bristol and this fit the bill. I didn't feel quite so smart when running for my plane later that day, due to terrible traffic, and us not knowing where Cardiff airport was (we flew into Bristol. Don't ask), but as you can see I made the plane and got home, still looking resonably OK.
Just realised this is the first pic of me wearing heels all month! I've managed a me-made OUTFIT every Friday so far this MMM. I wonder if I can manage one more? Is this not remarkably like my polka dot Violet? I mean, I know it's a popular pattern and the polka dot is not exactly something I invented, but it's just sooooo like mine! Part of me thinks "harrumph, the point of making my own clothes is that I get something totally unique", but the other part of me thinks "wow! someone on the other side of the world has the same taste and made the same decision I did. How cool is that!" I'd love to be able to send her a photo of mine for comparison! SB and P are doing peg puzzles in SB's bedroom. SB has a wide mouth zip bag, which I made him (unblogged) out of car print fabric to keep his peg puzzle pieces in, so they don't get lost. SB: That my car bag. P: Yes, Mummy made you that bag. Mummy is clever, isn't she? Isn't Mummy good at making things? SB (ethusiastically): Yes... Mummy good at making cereal! Me Made May has shown me how few of my finished items I have blogged. Not surprising considering I've been sewing for 4 years, but only blogging for 5 months. I thought I'd rectify this, by continuing my "Here's one I made earlier" series, and am kicking off, by special request of Jenny, with my Colette Violet blouse. I made this at some point last summer, so don't remember the finer details, but will tell you what I can. The background is white and the spots are navy and I love it! I cut a size 4, as per my measurements. This is actually a little large as you can see here. The shape is meant to be loose, but I find it a little boxy on me, and the excess fabric bunches up under cardigans and jackets. The side seams tick out slightly weirdly at the bottom as you can see from the photo on the right, due to the shaping. Furthermore, the bust darts are too low and it's a little short. I know now though that Colette bodices are short on me. The width, plus the shortness, make it a difficult blouse to tuck in, without constant re-tucking and fiddling. In general though, this is a blouse that requires constant adjustment to keep it sitting right. Not a major fail, just annoying. Somewhat bizarrely, the fit looks much better in my first photo above - the excess fabric must have moved round to the back - I told you it requires constant fiddling! But it's making me wonder if I should consider taking the sides in a little. Thoughts? This was my first attempt at both a collar and buttonholes. The collar, again, doesn't sit quite right. If you look closely at the photos above, you can see a fold/rumple on the collar on the left hand side. It's as if the collar is too big for the blouse, and I seem to remember finding this when I attached the collar to the blouse. I made this in sewing class, so wonder if the collar maybe stretched whilst being carried back and forth each week? Again, just slightly annoying. When wearing the blouse with a cardigan, I often pull the blouse out over the top of the cardigan, which alleviates the problem slightly. I found the buttons in the same shop as the fabric (Cloth Shop), and they are an amazingly perfect match. I believe this gives it quite a professional look, which makes up for the fit issues mentioned above. Despite the fit issues, I love this blouse. It got a LOT of wear last summer. In fact it was a bit of a staple with my orangey-coral cardigan and my mint green jeans, and it's pulling its weight so far this Me Made May. And, miraculously, I seem to be able to wear it without spilling anything on it! Good clear instructions. Nice, simple, wearable blouse with lovely details. Sizing not quite right, but I'm discovering that's the norm with Colette patterns and I. No. This was in the days before I made adjustments, unless the fit was truly dire. No. This is straight out the packet. Did I try anything new? Collar and buttonholes. Mixed results with the collar, but I fell in love with my one step buttonhole stitch with this project and went on to make my Kelly and my button back blush blouse shortly afterwards. Will I make it again? I have been planning to do so, but never quite got round to it. I did buy fabric to make another, but am now thinking I might use that for another Laurel instead. I will make another Violet though. It's a really wearable style. I did later accessorise with the same necklace I wore last week (the flower one) and a RTW cardigan. Happy with outftit: 5/5 (once I had the necklace on). Love the blouse, still getting loads of compliments for it and it seems to go with every single item in my wardrobe. Win! Happy with outfit? 5/5 I love the nautical look of this outfit. The tee is a new buy, from Anthropologie, but is guilt free as it was bought with a giftcard that I received from my brother for my Christmas. he photo is a bit blurry, but it's a rope print, which will be very apt for our seaside holiday next month! Happy with outfit: 3/5. Nothing in particular wrong with this, I just felt a bit blah. But it was a Monday, and we were having a Chores Day. Happy with outfit: 4/5. This skirt was the very first thing I ever made. It's a little big on the waist, but it's very comfy and I love the print, which is chrysanthemums. I don't wear it much any more as I went off it a bit after I had Small Boy. Not sure why really, as it looks fine in the photo! Maybe I just need something more exciting to pair it with. Happy with outfit: 4/5. This is really the wrong fabric for this blouse. The pattern calls for a more drapey fabric, such as double knit, lightweight crepe or tropical wool (whatever that is). As such, it doesn't really hang right and has a tendency to make me look pregnant but I like the shape of the shoulders and the pleats at the neck, so I'm not put off by that. I hadn't worn this since last summer, so it was a nice surprise this morning to find something else me made that I hadn't yet worn for the challenge! I am wearing no shoes because they got wet in the rain, and are now drying. What you can't see from this photo is that they also dyed my feet orange! Happy with outfit: 3/5. I just don't love this t-shirt! I wouldn't be wearing it this much if it wasn't Me Made May. I like the other versions I've seen out there, I just don't like mine. And you get a back view today because you must be fed up of seeing the front of that skirt by now! Have you ever seen a more spring appropriate blouse in your life? This has been in the making for over a month now. You'll remember my original post about it here. I'm not sure why, but I fell out of love with it when I was making it. There is absolutely no reason for this. The pattern was really easy to put together and it needed absolutely no adjustments for fit. The instructions were clear and I made the insides pretty (French seams). But for some reason I was dragging my heels making it. But once I'd got my Laurel and my Kelly out of the way, I forced myself to finish it before starting anything else. And the result?.... I LOVE IT! (Katy, you were so right!). As I said above, the fit is great on this. I was in between the size 3 and 4 in terms of my bust measurement, but opted for the 3 since the finished garment sizing seemed to indicate it would be fine, and I'm glad I did. The 4 would have been too big. The placket doesn't quite match up at the top or the bottom. I could easily resolve this if I moved the buttons. I made the pin tucks first, and then cut the underlining (white cotton lawn) to match the same size. I then basted the underlining in place and from thereon in treated the 2 layers as one. The sleeves are unlined. There are French seams throughout, other than at the armscyes, where I used my overcast stitch, so the insides are pretty too. My pin tucks could be better, but their slight unevenness isn't obvious. And that's it! Happy girl! Easy to sew. Great instructions (online). Fitted perfectly. Sleeves weren't my cup of tea. Took 5 inches of volume out of the sleeves. French seams (I actually had done these before I started my Laurel). Possibly. I'm not sure I can see lots of these in my wardrobe as it is quite a distinctive silhouette, but if I can come up with enough variation, then quite possibly. Maybe a short sleeved or sleeveless version next time? AKA panic sewing item number 1. Unfortunately I realised that I really could do with a black work skirt for MMM13 (my Charlotte is really too wintery to be wearing in May) and I spotted (no pun intended) and loved this fabric in John Lewis, while killing time waiting for a friend. I have fancied making a buttonless version of the Kelly for a while now, and this seemed like a good reason to try it. I know that I definitely squeezed my first Kelly into less than a metre of fabric. In fact I know I did, because I made notes on my pattern and I even drew out my pattern layout. So, I bought a metre of fabric. My handwriting truly is this bad! But could I get the pieces to fit? I have absolutely no idea how I managed this last time. My fabric this time was 140cm wide and my notes said the denim was too, so not sure what changed, unless I just mis-measured last time? Could the denim have been wider than 140cm? Anyway, fortunately I had decided already to do the buttonless version, which meant pattern piece 1 became narrower. But since it was to be buttonless, it needed to be cut on the fold... Luckily by folding both selvedges into the centre, I was able to fit and cut all the pieces. Hurrah! I made a small attempt to pattern match the dots, but quickly gave up when I realised they weren't printed true to the grain. Probably just as well, given my shortage of fabric. The skirt went together beautifully. I folded pattern piece 1 (front skirt piece) down the centre of the buttonhole placement, and treated that like the centre of of the skirt, making that the edge to place on the fold. I changed the order of doing things slightly, to account for the differences. I used a quilting cotton with a bubble spot as a contrast pocket lining. I put an invisible zipper in the side (right hand, as you are wearing it) and I just attached the waistband accordingly, cutting it slightly shorter and leaving an overlap, so I could fasten it with a button. The inside is neat because I treated all seam allowances with my overlocking stitch on machine again. I much prefer this to a zigzag, so may start to buy extra thread to allow for it. I could have French seamed this fabric, as it's fairly lightweight, but as per my previous Kelly, I cut this in too small a size (knowingly this time) and so used 5/16th" seam allowances instead. Halfway through I had a "duh" moment, when I realised this is pattern is pretty much made of rectangles, so would be the easiest thing in the world to size back up to the correct size. Next time. The buttonhole is the only thing I'm not happy with on this skirt. For some reason I decided to make it a vertical buttonhole. No idea why - I don't even know that it was a conscious decision, in all honesty. But now that I've worn it for a day, it is pulling and I can see that a horizontal buttonhole would have been preferable. After one day's wear. Will this last? But the buttonhole is the only thing I don't like about this, and that's not too shabby, is it? LOVE this pattern. Love the polka dots. It's a useful skirt and I love it with my polka dot blouse! Cut an XS because I did this last time and I cut out the paper pattern! Reduced seam allowance on side seams by 5/16ths" to make up for this. No buttons at front, instead I cut the front pattern piece on the fold, and added a side zip instead. Horizontal buttonhole. Size up pattern to bigger size. Happy with outfit: 4/5. This is a functional, rather than style driven outfit, so it serves that purpose. Worn to swimming lessons, first thing this morning, then gardening later on (with a fleece AND a hoodie on top, both RTW). I don't love this t-shirt because I messed up the neck and it's ended up slightly v-neck, rather than the boat neck of the design. But it serves a purpose, and is really comfy, so I've held on to it. You will probably see this every Saturday during May, as it's my only handmade knit top and I need something comfy and easy to pull on and off to get changed quickly for swimming, and which doesn't get crushed in a bag in a locker! Got a comment and a favourite from MariaDenmark on Flickr for this one. Woop woop! Happy with outfit: 5/5. Loving mixing pink with orange just now! Worn to Small Boy's friends' 3rd birthday party. 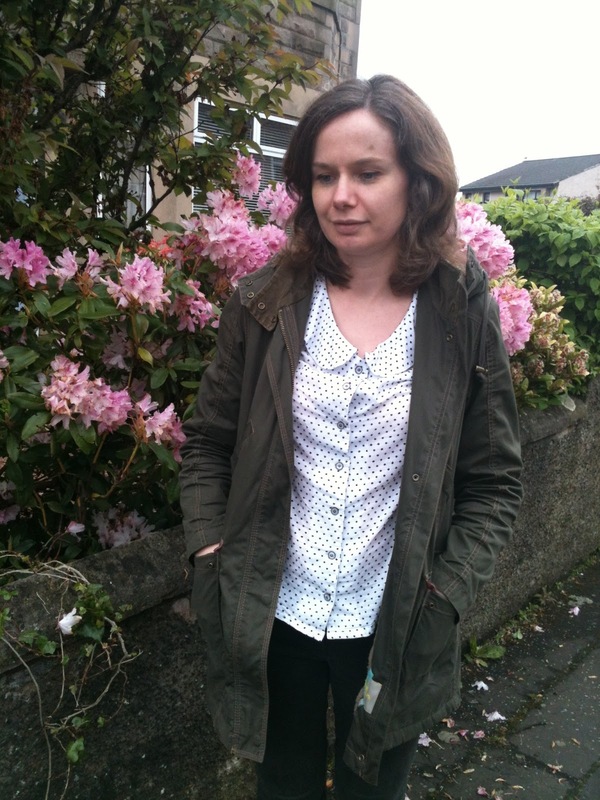 Rest of outfit: RTW, including bargain £20 cardigan from Boden Sale last week! Happy with outfit: 4.5/5. I really like this top, but I don't love it. I think it's the elastic neck. It reminds me of that peasant look that was so big in the early 2000's, and I'm not a huge fan of raglan sleeves. Not sure why. But still, I love the fabric and I love the colours, and the top is very comfy and easy to wear (although it is ever-so-slightly small across the bust). I am also stupidly proud of the pattern matching across the side and back seams, which I will remember to show you some day. Skirt: Red Denim Kelly. Yes, again already. 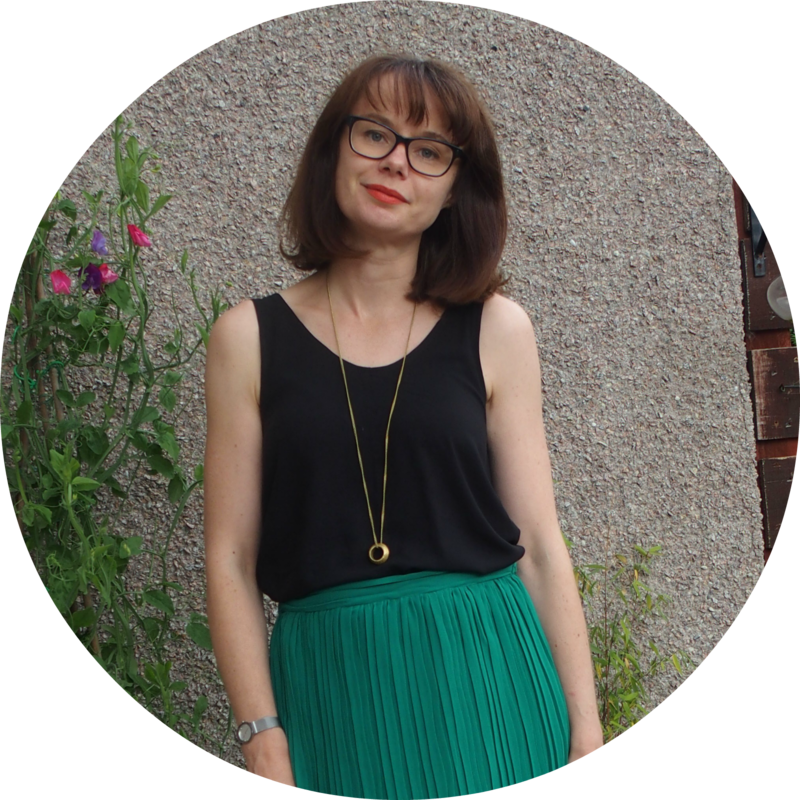 Rest of outfit: RTW, including free Boden tee! Accessorised with BIG hair. It was windy. Happy with outfit? 5/5 Another favourite outfit, although the shoes are a recent addition. Happy with outfit? 4/5. This used to be a favourite skirt, but I'm going off it a wee bit now. I don't feel bad about this though, because this was the first thing I made after I had Small Boy and it's been worn to work most weeks since then! So it's had a good 2 and a bit years of wear! Happy with outfit? 5/5. The skirt actually has small white polka dots which haven't photographed well. I had this polka dot combo in my head but wasn't sure it would work in practise, but it does!!! I love it! The skirt also has contrast polka dot pocket lining, so polka dots all round! What better way to finish the week? And my first me made outfit of MMM13 so far. Round up thoughts for the week. I wear jeans too often, when not at work. I need to make more knit garments/t-shirts. I have lots of garments I still need to blog, which were made before I started blogging. I have run out of photographic locations around my house! Umm... I won again! I really don't win things outside of the blogging world, so not sure why this is different here! 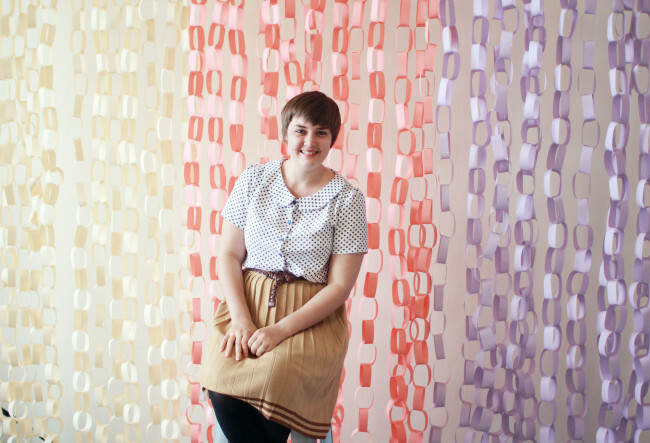 The very lovely Ruth, over at The Polished Button, has just opened her online store. Previously she sold on Etsy, but this is an actual web store. Go have a look! To celebrate its opening, Ruth had a week of giveaways on the run up to the launch, and one of those was 2 metres of this lovely fabric, which I won!!! It arrived in the most lovely packaging. The measuring tape is actually a sticker, as is the round button. The dressform is Ruth's beautiful business card! It makes me want my own business, just so I can buy cool stuff like this! Ruth described the fabric as a cotton chambray. It's beautifully drapey and lightweight. Perfect for summer. I haven't yet figured out what to make with it. Ruth has some for herself, which she is planning on making into a Mathilde. I am thinking maybe a Laurel dress? Or a Miette? 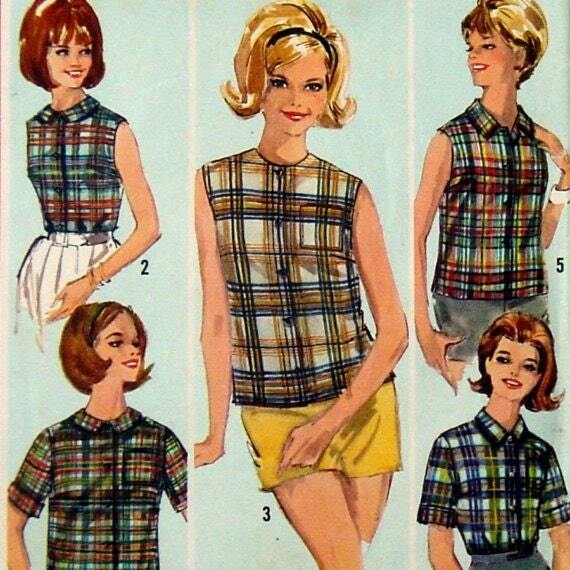 Or what about this vintage pattern? I'm not sure how best to do this, so I'll start this way and see how I get on. I thought I'd do a round up post once a week (a Friday, if possible). I'm doing rubbishy old selfies in the morning, to ensure I capture the outfit and if I have time I'll try to photograph it properly later in the day. Hopefully you'll mostly see the proper photos. Oh, and I've decided to rate my outfit on how happy I am with it each day. The score is out of 5. Photo taken on iPhone, which clearly isn't working. Oh - Megan Nielsen, HERSELF, favourited and commented on this photo! How thrilling?! Happiness with outfit: 5/5, although not sure if this is a bad angle, or if I REALLY don't suit these jeans. Rest of outfit: RTW. And yes, they are the same jeans as yesterday. Lazy dressing! Happy with outfit? 5/5. I basically lived in this outfit last summer! Short week, this week, so relatively easy so far! If you are taking part, how are you finding MMM-13 so far?